Waste of money, don't bother. This doesn't work. Pushed the fluid through three times, but the brakes still didn't work. The squeezable fluid container is flawed because it if you release the pressure by the slightest it will introduce air into your brakes. The only way to do this properly is to use a syringe. Eventually gave up and took the bike to a competitor to have it done professionaly for just £20. Diaspointed. Not actually a bleed kit? Its my fault for not reading what came in the box, but i was expecting to be able to do a full bleed with this, which would need a syringe and reservoir and all the other little bits you need. this is simply the oil and a spare tube. i still managed to use it to top up my brake fluid, but was unable to fully bleed the system. 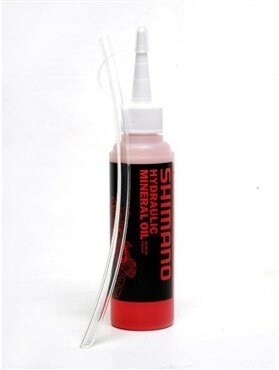 Very quick and simple to change the fluid in your hydraulic brake system. You have to remember that there is only a limited amount of fluid so if you have air in the pipes still you may have to recycle some of the fluid to fully bleed the pipes.